Courtesy of Michele Holmes/Andrea Posadas. 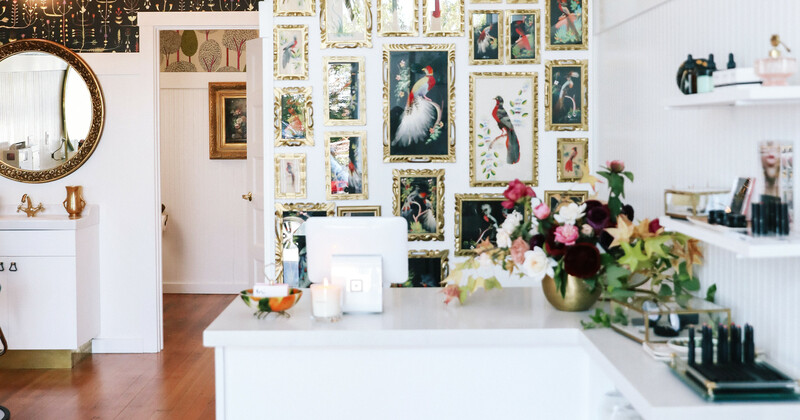 Michele Holmes made a major career switch — and her new office is a dreamy design haven. With a degree in fashion and a background in buying, merchandising, marketing, and sales, Holmes set out to pursue her passion for beauty. And now, she's known as the Bay Area's very own "eyebrow whisperer." About twelve years after she started doing brow house calls, this entrepreneur built a business exclusively through word of mouth. 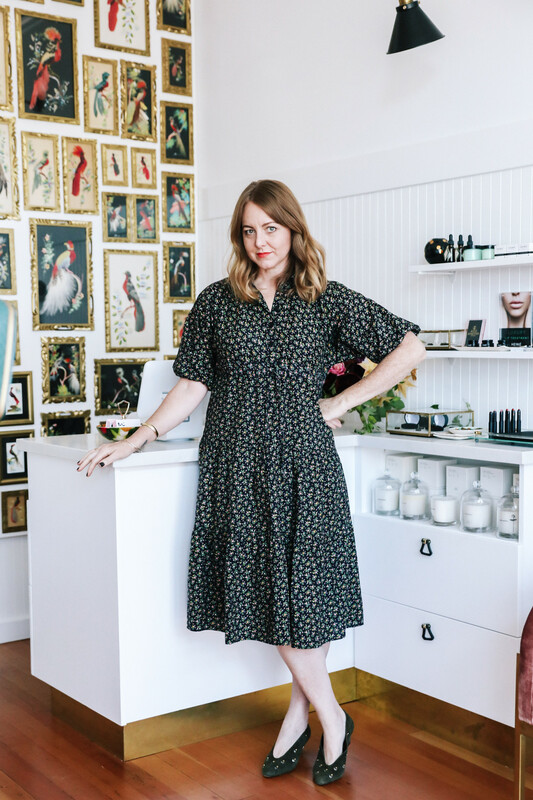 Until recently, she was the the "little black book secret" brow guru in S.F. and Marin — the self-care expert only known by insiders. 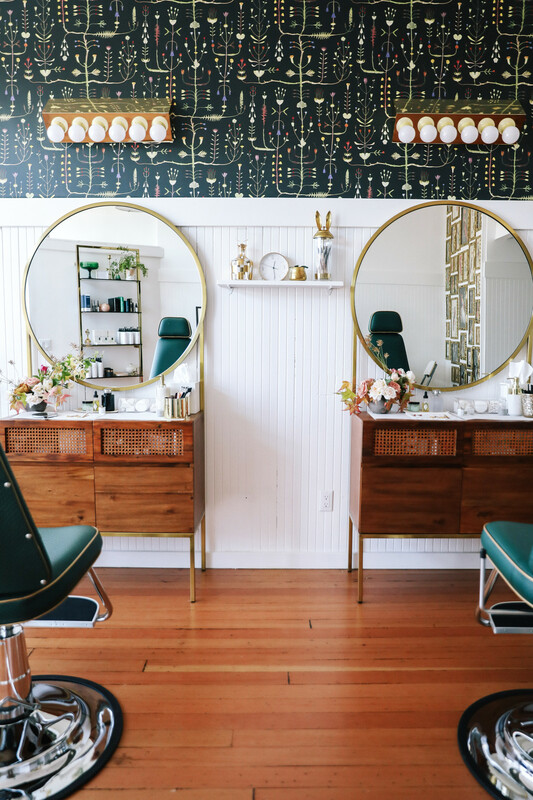 But, after receiving beauty recognition from The San Francisco Chronicle, Goop, InStyle, C Magazine, and more, Holmes was ready to establish a brow hub. 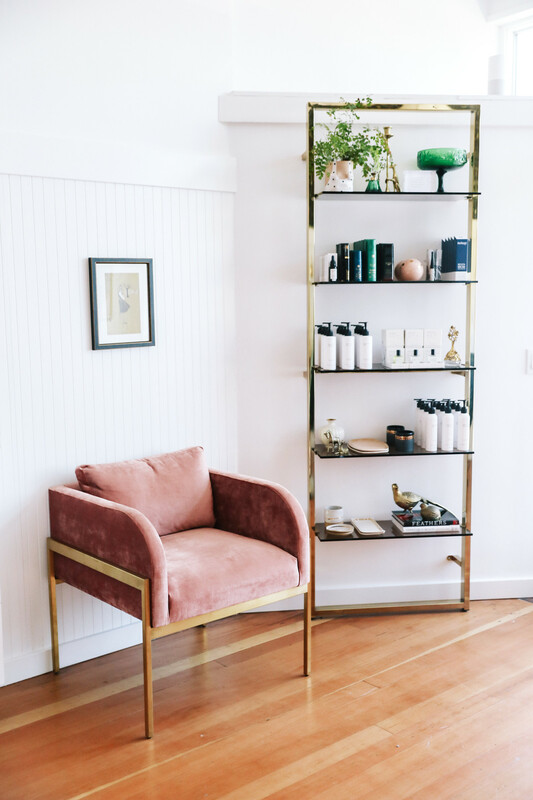 Her Corte Madera salon is an escape from reality — a place to go in between errands or for a long afternoon spent in the salon chair. In her new spot, the brow queen created a whimsical space filled with botanicals, texture, natural light, and of course, beauty. Read ahead to hear from the business owner herself. Lonny: What was the inspiration behind the design of your studio? Michele Holmes: A major source of inspiration was our many trips to London and the English countryside. We go every summer to visit my in-laws. I was inspired by all the quirky hotels and estate houses we visit along the way. Lonny: How would you describe your design style? MH: I love mixing antique art and decor with modern furniture. I describe my person style as "modern grandma," which I definitely injected into the design plan. Lonny: You've had a busy career already. What led you to this project? MH: I used to have my studio at my house, and I was running around San Francisco doing house calls. It was getting too busy and I wanted to hire another brow artist. My husband had just lost his job and said, "Let’s find you a space and I’ll help you build it with my newly found spare time." We signed a lease 2 months later. I always envisioned myself having a retail space and the brow demand legitimized the immediate need to make it happen! Lonny: Beauty appointments are always something we look forward to. Was the design meant to elevate the experience? MH: Absolutely! I wanted my guests to feel like they were hanging out at a friend’s house rather than a typical salon or spa. Lonny: Can you expand on some of the standout design details, such as the wallpaper and furniture? MH: I picked the black botanical wallpaper as a focal point for the service wall. The first time I saw it, I knew I had to have it. It looks like the flowers are blooming from the wall. It really spoke to me and my clients say they love staring at it during their appointments. It has a calming effect. The rosewood velvet couches were brought in to bring soft balance to the hard functional furnishings throughout the space. Lonny: Did you already have an appreciation for design too, or did that come with this project? MH: My appreciation for design runs deep. I am an interior design junkie, and I'm always redecorating my house. I love collecting design magazines while traveling abroad. I also went to school for fashion, where I shared many core classes with the interior design program. After school, I held jobs in buying, merchandising, and sales for the snowboarding industry (I love snowboarding, too). I already had a solid background in building branded retail environments for other people, so it was incredibly fun to finally design my own with ZERO rules. Lonny: What is your favorite element of the space? MH: My bird wall! I collected 42 vintage Mexican feather craft paintings. I saw one in an antique store, fell in love with it, and then sourced more via Ebay, Etsy, etc. I replaced all the glass, dusted all the real bird feathers, and gold foiled all the frames. It was a PAIN, but I love them so much. I have this silly theory that they fly off their wall & into the floral wallpaper at night when we are gone. I think they really bring the space to life hence daydreaming them coming to life after hours. Lonny: What was a MUST HAVE for you when envisioning this space? MH: Natural light and old charm. I must have looked at 20 spaces before landing on this one. The whole front wall is glass and the floors are original redwood from 1928. I didn’t want completely new construction as I didn’t think it wouldn't mesh well with my old European design vibe. Even though this space is smaller than I wanted, I feel like it has a lot of soul. Lonny: How do you hope customers feel when arriving in and leaving the studio? MH: I want my clients to feel like they are taking a little vacation form their lives. Our appointments are a bit longer than usual, so the joke around here is that this is “brow therapy." My clients are like family and we share a lot of laughs and tears in these walls. I want everyone to feel welcome to come early, stay late, or say hi anytime. We have a wine bar next door and you can bring a glass over and hang out. Our last clients of the day often become our happy hour dates. I’ve had many people say this is the appointment they look forward to the most. It's the best compliment and validation for this little studio we worked so hard to build.